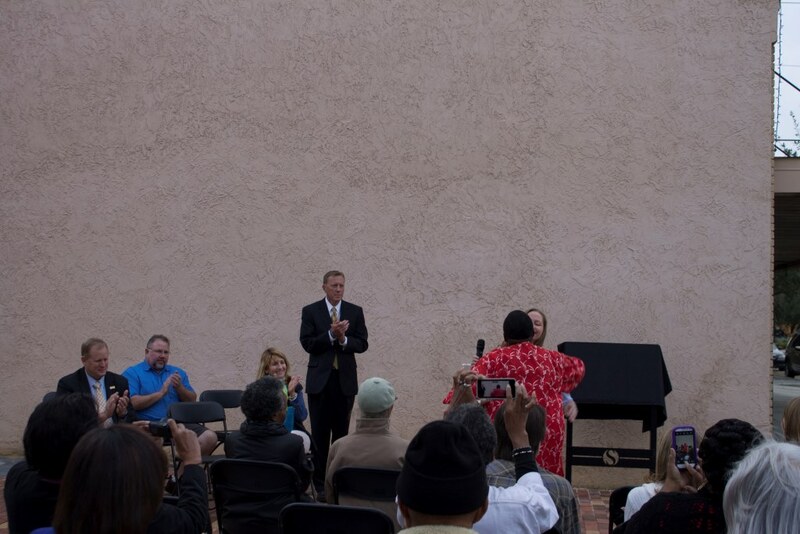 Special thanks being given to Patricia Ann Black (1956- ), who can be seen wearing red in the photographs, at a ceremony commemorating the completion of the Sanford Avenue Streetscape and the unveiling of several heritage markers. 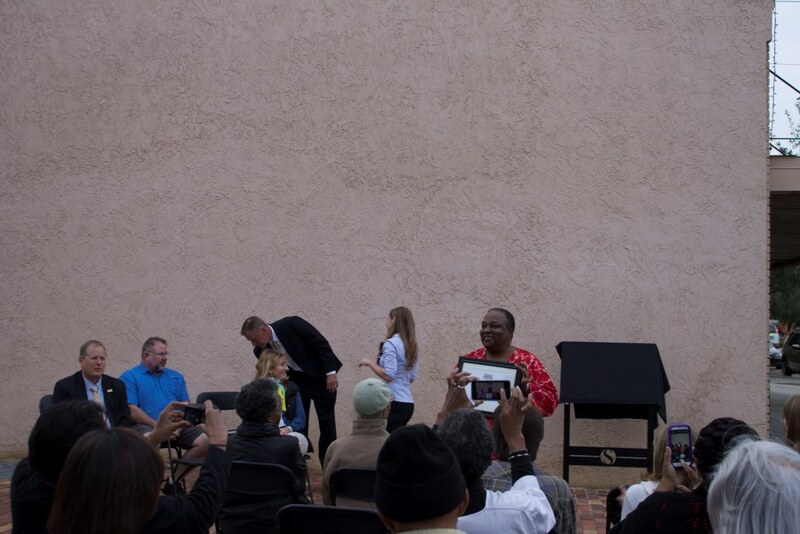 The unveiling of the heritage markers was held in Paulucci Park, located at the southwest corner of First Street and Palmetto Avenue in Sanford, Florida, on November 20, 2014. 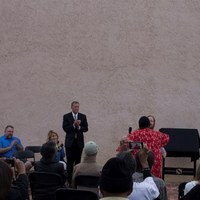 Sanford Mayor Jeff Triplett is seen standing in the center of the photographs. Black's father, Pilgrim Black (1905-2002), was featured on the Heritage Marker #3. Pilgrim Black was born in 1905, although some records list 1907 as his birth year. Pilgrim and Lula Mae Haynes (1917-2007) Black were migrant crew leaders, and thus migrated to Wayne County in Upstate New York in the summers and back to their home in Sanford for the rest of the year. Pilgrim was the son of Harry Black (d. 1911) and Maggie Benjamin Black (ca. 1870-ca. 1934), who migrated to Sanford from South Carolina in the 1800s. Harry and Maggie had several children: Leckward Black, Mustar Black, Malachi Black, Leatha Black Walker (1889-1976), Pilgrim Black, Margaret Black Jones (1889-1976), and Harriett Black Lawson. In 1911, Harry owned a grocery store at 206 South Sanford Avenue. One day, he came home from work with pneumonia and passed away shortly thereafter. Pilgrim was nine years old when his father passed away. Maggie was the daughter of former slaves, Isaac and Roseanna Benjamin, and the sister of Nathan Benjamin, Pledge Benjamin, Sam Benjamin, Loui Benjamin, Chainey Benjamin, Lara Benjamin, Melvina Benjamin, and Katie Benjamin. 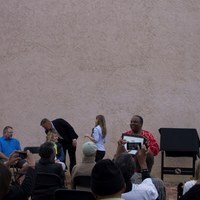 Lester, Connie L.. “Special Thanks to Patricia Ann Black at the Sanford Avenue Streetscape Completion and Unveiling of Heritage Marker Ceremony.” RICHES of Central Florida accessed April 20, 2019, https://richesmi.cah.ucf.edu/omeka/items/show/4656.